Well the harvest is in, so we’ve got chestnuts all over the place. Australia’s chestnut season begins in March, and goes all the way through to the start of July, but my favourite variety, De Coppi Marone, has just been picked and they’re on the shelves now. Other varieties you might see around are Buffalo Queen (early season), Bouche de Betizac, Red Spanish and Purtons Pride (late season), but to be honest, most people find them all pretty similar (although the Buffalo and Red Spanish varieties can be a little dry when roasted). The key thing to remember is that you don’t want horse chestnuts (conkers), from ornamental trees that are part of the lychee family. These have some medicinal uses, but if you eat them raw, they’ll just make you sick – much better for playing games with. Nor do you want water chestnuts, which are an aquatic sedge, and are not nuts at all, as you eat the tuber that grows beneath the surface (well, you might want them, but they’re not the ones in season in Melbourne right now). 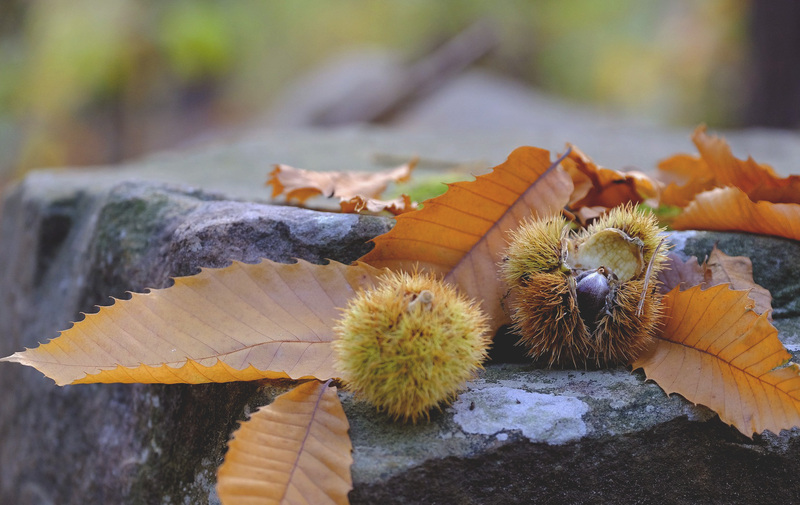 No, our chestnuts – sea urchin-like baubles that are ready as the leaves begin to turn amber – are part of the Beech family, and so in Australia, it’s no surprise to find that most of them grow around Beechworth. 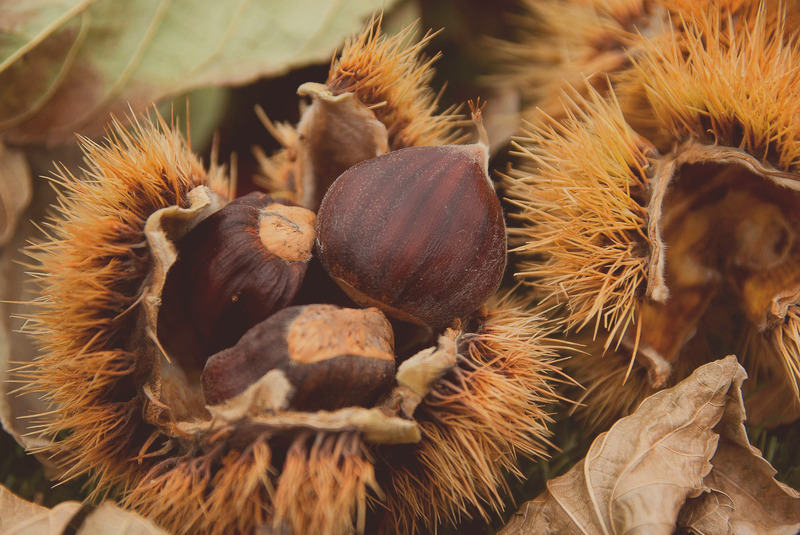 When chestnuts are fairly recently harvested, they will be very firm and feel heavy for their size. The outer shell should be smooth, glossy and undamaged. Don’t buy any with dark areas or holes as this can indicate fungus or pest infestations. Give a couple of nuts a shake – if they rattle inside, this means they’re old, dry and shriveled inside. Chestnuts keep very nicely just on the bench for about 3 weeks, maybe even more if you purchased them very fresh. Once they’ve been peeled, they only keep for a few days though, and it’s best to store them in the fridge. However, they can lose flavour when you do this, so it’s best to peel them just when you need them. 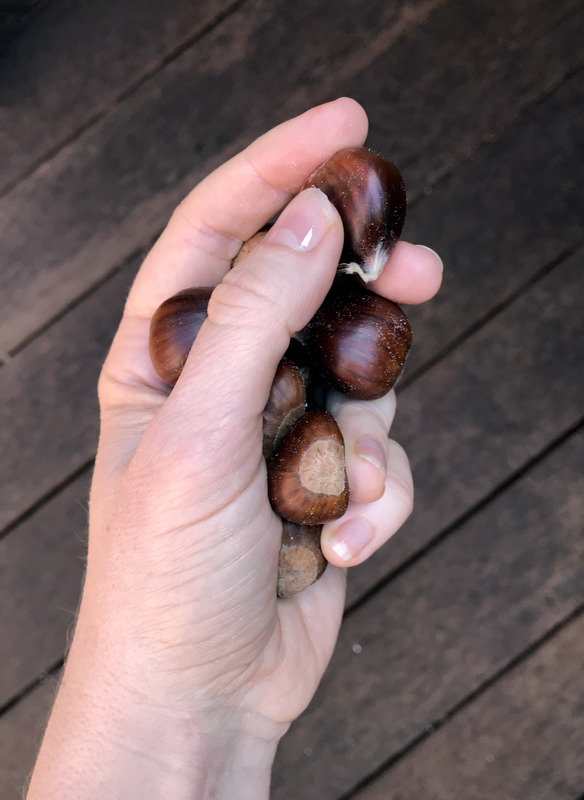 If you have a glut, never fear – considering they’re nuts, chestnuts are quite high in carbohydrates and make a lovely gluten-free flour. Dry the peeled nuts (pre-prepared as below) on the lowest setting in your oven for approximately 4-5 hours, or until they are hard and brittle, then grind to a fine flour in a spice grinder or blender. Keep in the fridge for up to 6 months, or divide into batches and freeze. Chestnuts also are fabulous when preserved. There’s a simple process here on Taste, which provides a sweet nut best eaten whole for dessert or used in sweet baking. Then there’s River Cottage’s chestnut jam (superb on toasted brioche). You can also candy them. It’s fairly easy to buy chestnuts peeled and tinned (Clement Faugier brand is fairly easily available here), without added sugar, so they are perfect for using in savoury or sweet dishes, I assume there are therefore other methods to preserve chestnuts but google is not my friend here – please comment if you can help! Don’t eat raw chestnuts, they’re tannic and it’s really just not worth it. The window is quite small between when they are just dried out enough yet not too old and crusty. Besides they’re absolute blighters to peel when raw so it’s just easier to cook them first. After cooking they need to be stripped down. First the hard shell – which has a remarkable tendency to get stuck under your fingernails and bite into the quick – and then also a husk just inside that, which wipes off fairly easily with a dry towel. Roasting is my favourite way to prepare chestnuts, I just like the way the flavour develops with char and smoke. With a sharp knife, score a line around the outer shell (some like to cut an ‘x’ into the flat side instead), then place them on an oven tray in a fairly hot oven (200°C) for 30 minutes, or until the casing begins to recede from the flesh. Remove, cool and peel. Use the same technique for an open fire, just use a cast iron tray instead, or cook on direct flame for about 10 minutes. 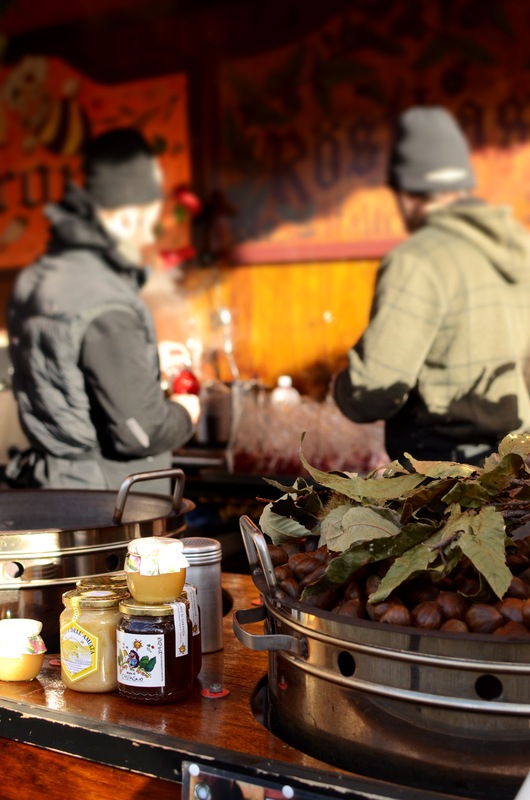 Just like with roasting, to steam chestnuts you should always score a line on the shell before heating, so the nut doesn’t explode as the steam builds up. Then place in a steamer and let it do its work for 15-20 minutes. You can place the chestnuts directly in the water and boil them instead, but these tend to be harder to peel. It’s also possible to microwave chestnuts, but for me this just takes all the magic out of it. If you must, just score then place on an open microwave-safe dish and start with 1-minute bursts (all microwaves differ), and peel once the shell is receding and the flesh is beginning to soften. I think the best way to eat chestnuts is whole, cooked in cream. 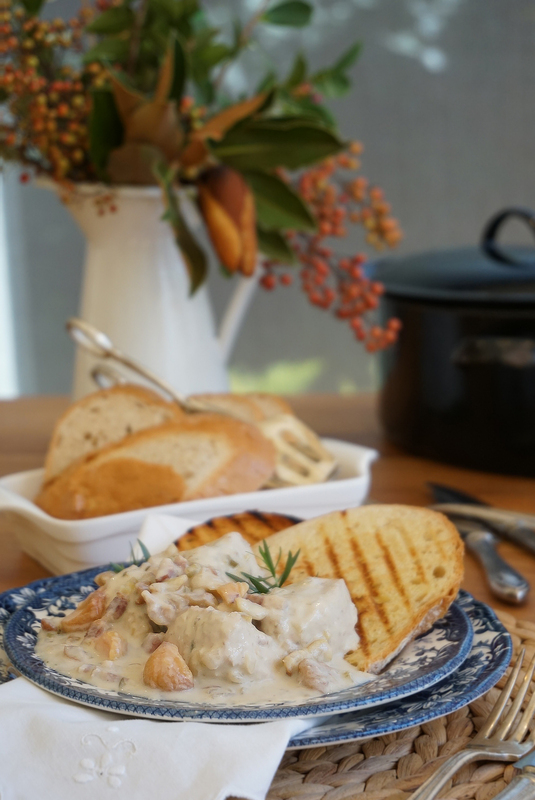 I made this chicken and chestnut fricassee recently, and it’s already a family favourite. Such beautiful photos. I can’t get fresh chestnuts where I live, unfortunately. Once I got a jar of them from Williams-Sonoma and put them in a cabbage dish, and they were just awful. Maybe next fall I’ll try to order some fresh.